Anzus Lake: Anzus is located southwest of the community of Fraser Lake. Just west of Fraser Lake on Hwy #16 turn south (left) onto the Francois Lake East Road. Follow this road around the east end to the south side of Francois Lake. From here follow Binta Forest Service Road to Anzus Lake. Rainbows up to 3 lbs, and Lake Char reaching 20+ lbs can be caught in Anzus Lake. Augier Lake: Augier is located approximately 40 km (25 mi) north of the town of Burns Lake, in-between Pinkut and Babine lake. Augier is a popular destination and contains good Rainbow and Lake Char populations. Babine Lake: From the town of Burns Lake, head north on the Babine Road off Hwy #16. This legendary lake contains large Rainbows to 12+ lbs, Cutthroat to 2-1/2 lbs and Lake Char that are capable of reaching 35 lbs. Barton Lake: From the city of Prince George travel west on Hwy #16. Turn south (left) onto the Blackwater Road. Continue southwest to the lake via secondary roads off the Blackwater Road. Barton supports fisheries of Rainbow trout, Whitefish, and Eastern Brook trout. Bednesti Lake: From the city of Prince George travel west on Hwy #16 for approximately 50 km (31 mi). Bednesti is located just south off Hwy #16. This popular lake supports fisheries of Lake Char, Kokanee, and Rainbow trout. Binta Lake: From Burns Lake turn south onto Hwy #35 and travel to the community of Francois Lake. Take the free, 20 minute ferry ride across Francois Lake to the community of Southbank. From the ferry dock at Southbank turn left and follow the main road heading southeast to Uncha Lake. Turn right on Campbell Road and next onto Binta Road which will take you to the lake. Binta supports a good Rainbow and Lake Char fishery. Much like Uncha Lake, Rainbows will reach up to 2+ lbs. while Char are capable of 20+ lbs. Buckhorn Lake: The Willow Forest Road is located 15 km (9.3 mi) south of Prince George off of Highway 97. Due to recent kill-off there are no fish in the lake. Bugle Lake: From the city of Prince George travel north on Hwy #97 North to Chief Lake Road. Turn west (left) and follow Chief Lake Road to secondary roads that lead to Bugle Lake. Bugle hosts a good population of Rainbows to 3+ lbs. Burns Lake: Burns Lake is located on Hwy #16 approximately 80 km (50 mi) east of the town of Houston. Excellent fishing for Lake Char up to 25+ lbs and Rainbows to 2-1/2 lbs. Carp Lake: From the city of Prince George travel north on Hwy #97 for approximately 145 km (90 mi). Turn west (left) onto the Carp-Tsilcoh Road and follow it to the Carp Lake Provincial Park. Carp Lake supports a productive Rainbow fishery for trout up to 6+ lbs. Chapman Lake: From the town of Smithers travel east on the Babine Lake Road to Chapman Lake. Chapman is a fair to good producer of Lake Char up to 8 lbs, while Rainbows and Cutthroat range in the 2 lb class. Chuchi Lake: Chuchi Lake is one of the Nations Lakes. It is located over 100 km (62 mi) by air from Fort St. James. Road access is possible via the Omenica access road. Rainbow trout to 6.6 lb and lake trout to 22 lb can be caught in Chuchi Lake. Collins Lake: From the town of Houston travel west on Hwy #16 to the Morice River Forest Service Road. Turn south (left) and follow it to the Morice West Forest Service Road. Turn west (right) and travel along this road until you reach the junction of the Morice River and Lamprey Creek. Turn south (left) and follow the Forest Service Road that parallels Lamprey Creek. This will lead you to Collins Lake. Collins supports a Cutthroat fishery with trout reaching into the 1+ lb range. Co-op Lake: Follow Hwy #16 for 23 km (14 mi) east from the town of Burns Lake. Turn left (north) off Hwy #16 and follow this secondary road approximately to the lake. Co-op Lake supports a good Brook trout fishery that is best fished on the fly. Crystal Lake: This small lake is located 4 km (2.5 mi) east of Highway 97 approximately 67 km (41.5 mi) north of Prince George. Rainbow trout to 1.5 kg (3.3 lb) are not uncommon and brook trout are reasonably abundant at Crystal Lake. Dahl Lake: From the city of Prince George travel west on Hwy #16 for approximately 42 km (26 mi). Turn south (left) onto the Norman Lake Road. Dahl Lake supports a good Rainbow fishery with trout reaching 1+ lbs Whitefish are also present in Dahl Lake. Davie Lake: The lake is located approximately 80 km (50 mi) north of Prince George via Highway 97. The lake lies 4 km (2.5 mi) west of the highway. Mountain and Lake Whitefish, Rainbow Trout, Dolly Varden are the game fish in Davie Lake. Deception Lake: Deception Lake is located east of the community of Telkwa, and can be accessed by taking Woodmere Road east from Hwy #16. Deception supports a fair to good Cutthroat fishery with trout up to 1+ lbs. Doris Lake: From the town of Smithers travel east on the Babine Lake Road. Doris Lake is located on the west (left) side of the road just past Chapman Lake on the way to Smithers Landing on Babine Lake. Doris is considered a good producer of Rainbows and Cutthroat in the 2 lb class. Eaglet Lake: The lake is located approximately 40 km (25 mi) northeast of Prince Goerge via Highway 16 to Willow River then to Giscome. Rainbow trout to 2.2 lbs are readily caught in early spring. Burbot are resident in Eaglet Lake. Elliot Lake: The lake is located north of Trembleur Lake. Rainbow trout are common in Elliot Lake. Elwin Lake: Elwin is located south off Hwy #16 from the community of Topley. Access to Elwin can be found at the southeast corner of the lake. Elwin supports a fair Rainbow fishery for small to medium sized trout. The lake also contains Whitefish. Finger Lake: From the town of Vanderhoof turn south off Hwy. #16 and travel south for approximately 75 km. (45 mi.) via Kenny Dam Road/ Kluskus Forest service road. Turn south at Km 59 of the Kluskus on to Gold road for 4 kms. only a two hour drive from Prince George Airport. Supports fisheries of Rainbow to 5 lbs and Kokanee to the 2 lb. range. Firth Lake: A BC Tel access road is located 116 km (72 mi) north of Prince Goerge on Highway 97. Follow this road 8 km (5 mi) east from the highway. Rainbow trout to 1.5 kg (3.3 lb) are not uncommon in Firth Lake. Fishhook Lake: The Tacheeda Lake access road is located 95 km (59 mi) north of Prince George off of Highway 97. Follow this access road east from the highway to the lake. Rainbow trout to 2.2 lbs are not uncommon in Fishhook Lake. Francois Lake: Francois can be found by travelling approximately 30 km (19 mi) south of the town of Burns Lake on Hwy #35. Francois contains a variety of fish species, including Rainbows to 3+ lbs and Lake Char that will reach up to 20 lbs. and larger in Francois Lake. Frost Lake: The Willow Forest Road is located 15 km (9.3 mi) south of Prince George. Follow this access road 5 km (3 mi) past Buckhorn Lake. Rainbow trout averaging 2.2 lbs are not uncommon in Frost Lake. Fulton Lake: Fulton Lake is located north of the communities of Topley and Houston, and can be reached by taking secondary roads north off Hwy #16. Fulton produces a good number of large Lake Char, Rainbows and Cutthroat trout. Great Beaver Lake: From Prince George travel north on Hwy #97 North. Turn west (left) onto Chief Lake Road. Great Beaver is found by travelling via Chief Lake and Teardrop roads. This large lake contains Dolly Varden, Kokanee, Lake Whitefish and Mountain Whitefish however it's Rainbow that can get up to 4+ lbs at Great Beaver Lake. Grizzly Lake: Follow the Willow Forest Road off of Highway 97 south of Prince George then turn east and follow for 5 km (3 mi) and then then turn southeast onto the access road to the lake. Follow this road for 5 km (3 mi) to the lake. Rainbow trout to 1.5 kg (3.3 lb) are not uncommon in Grizzly Lake. Hart Lake: The lake is located 77 km (48 mi) north of Prince George just off of the Hart Highway 97. Hart Lake is stocked annually with rainbow trout. Inzana Lake: The lake is located 60 km (37 mi) north of Fort St. James. A gravel access road off of this highway leads to the lake. Rainbow trout averaging 2.2 lbs. Char to 22 lbs are not uncommon in Inzana Lake. Ispah Lake: Follow the Willow Forest Road southeast from Highway 97 about 43 km to the lake. Although there are rainbow trout in Ispah Lake the majority of species are course fish. Kazchek Lake: This fly-in lake is located 80 km (50 mi) northwest of Fort St. James. Road access is also possible via the Leo Creek Forestry road. Good sized rainbow trout and char are resident in Kazchek Lake. Kitseguecla Lake is located approximately 40 km. (25 mi.) northwest of the town of Smithers. Turn west off Hwy. #16 onto Kitseguecla Lake Road and follow it for 18 km. (11 miles) to the lake. Kitseguecla supports a Cutthroat fishery with trout reaching up to 1+ lbs. Kloch Lake: This fly-in lake is located 90 km (56 mi) northwest of Fort St. James. Access is also possible with a 4X4 via the Leo Creek Forestry road. Large rainbow trout and char are readily caught in Kloch Lake. Knapp Lake: To get to Knapp Lake take the Francois Lake East Road located just west of the community of Fraser Lake off Hwy #16. Connecting roads to Knapp Lake lead off of Francois Lake East Road. Knapp can be at times an excellent fishing lake with Rainbows in the 1-1/2 lb range and Lake Char up to 15 lbs or better. Kathlyn Lake: Kathlyn Lake is located just north of the town of Smithers on Hwy #16. A short access road west off Hwy #16 will get you to a small day use area and boat launch site. Kathlyn supports a small Cutthroat fishery for trout up to 1-1/2 lbs. Little Bobtail Lake: From the city of Prince George travel west on Hwy #16 to the Bobtail Forest Service Road, located near the east end of Cluculz Lake. Turn south (left) and follow this road past Graveyard Lake. Little Bobtail is located between Graveyard and Bobtail (Naltesby) lakes. Little Bobtail supports a Rainbow fishery with trout that can reach into the 7 lb range. Ste. Maries Lake: Follow the Willow Forest Road, which is located 15 km (9.3 mi) south of Prince George, 28 km (17.4 mi) east to the lake. Rainbow trout are resident in the lake. Maxan Lake: Maxan is located west of the town of Burns Lake, and can be accessed by many secondary roads leading south off Hwy #16. Maxan is considered a good spring lake producing Rainbows up to 2 lbs and Lake Char reaching 15 lbs or better. McLeod Lake: From the city of Prince George travel north on Hwy #97 for approximately 130 km (81 mi) to McLeod Lake. This large lake supports fine fisheries of Rainbow trout, Dolly Varden, Lake Char and Mountain Whitefish. Morice Lake: From the town of Houston travel west on Hwy #16 to the Morice River Forest Service Road. Turn south (left) and follow it to the Morice West Forest Service Road. Turn west (right) and travel along this road until you reach the junction of the Morice River and Lamprey Creek. Turn south (left) onto the forest service road that parallels Lamprey Creek. This road will lead you past Collins Lake to McBride Lake. Morice supports a good fishery for Rainbow, Cutthroat and Lake Char. This large lake will produce Lake Char to 12+ lbs, Rainbows to 6+ lbs and Cutthroat to 3 lbs. Mossvale Lake: From the city of Prince George travel north on Hwy #97 North to Chief Lake Road. Turn west (left) and follow Chief Lake Road to secondary roads that lead to Mossvale Lake. Good fishing at Mossvale Lake for Rainbow trout up to 3+ lbs. Narrow Lake: The lake is located 65 km (40 mi) from Highway 97 via the Willow Forest Road. The fishing on Narrow Lake is rather unpredictable but a wide range of species are resident in the lake. Ness Lake: From the city of Prince George travel north on Hwy #97. North for approximately 15 km (9.3 mi). Turn west (left) off Hwy #97 North onto Chief Lake Road. Drive to the lake via Chief Lake and Ness Lake Road. Rainbows up to 6+ lbs are what most anglers are trying for in Ness Lake. Ootsa Lake: From the town of Burns Lake head south on Hwy #35 to the community of Francois Lake. Take the free, 20 minute ferry ride across Francois Lake to the community of Southbank. Continue south on Hwy #35. Turn right (west) on the Oosta-Nadina Junction Road and follow it to Oosta Lake. These waters can yield spectacular results for large Rainbow and giant Lake Char at Ootsa Lake. Opatcho Lake: Follow the Willow Lake Road, which is located 15 km (9.3 mi) south of Prince George, 33 km (20.5 mi) east to the lake. Good sized rainbow trout to 3.3 lb are readily caught at Opatcho Lake. Owen Lake From the town of Houston travel west on Hwy. #16. Turn south (left) onto the Morice River Forest Service Road. Stay on this road until you get to the Morice-Owen Forest Service Road. Turn onto the Morice-Owen Forest Service Road and follow it to Owen Lake. Rainbows can reach up to 2 lbs., while the Lake Char are capable of going to 20+ lbs. Parrott Lake: From the town of Houston travel a few kms west on Hwy #16 and then turn south onto the Buck Flats Road. Follow this road until you reach Parrott Lake Road. Turn right onto Parrott Lake Road and follow it to the lake. Considered to be excellent family lakes, Parrott lakes support good numbers of small wild Rainbow trout. Peculiar Lake: The Hall Lake turnoff is located 78 km (48.4 mi) north of Prince George just past Crooked River Provincial Park. Follow this turnoff 31 km (19.2 mi) northwest from Highway 97 to the lake. Rainbow trout and kokanee are readily caught at Peculiar Lake. Pinchi Lake: An access road is located 25 km (15.5 mi) north of Fort St. James. Follow this access road west to the lake. The fish in Pinchi Lake have mercury poisoning and should not be eaten. Pinkut Lake: Located north of the town of Burns Lake, Pinkut can be found by taking the Babine Lake Road north off Hwy #16. Pinkut supports both a Rainbow and Lake Char fishery featuring bows reaching up into the 3-1/2 lb range and Lake Char that have been reportedly caught up to the 20+ lbs. Pitoney Lake: This lake is located 55 km (34 mi) from Highway 97 via the Willow Forest Road. Trout, whitefish and burbot are plentiful in Pitoney Lake. Punchaw Lake: From the city of Prince George travel west for approximately 10 km (0.62 mi). Turn south (left) onto the Blackwater Road and follow for approximately 50 km (31 mi.) to Punchaw Lake. Very good spring fishing for Rainbow trout up to 2+ lbs. Purden Lake: Purden Lake is located just beside Highway 16, 70 km (43 mi) east of Prince George in Purden Lake Provincial Park. Rainbow trout of up to 4.4 lbare readily caught at Purden Lake, Burbot are also resident in the lake. Shesta Lake: From the city of Prince George travel west on Hwy #16. Turn south (left) onto the Blackwater Road, and drive for about 21 km (13 mi). Turn onto the Clear Lake Road and follow it 5 km (3.1 mi) to Shesta Lake. Shesta supports a Rainbow fishery with trout reaching into the 2 lb range. Slender Lake: Follow the Willow Forest Road, which is located 15 km (9.3 mi) south of Prince George off of Highway 97, past Stony Lake to Slender Lake. Rainbow trout, Dolly Varden and whitefish are abundant in Slender Lake. Stony Lake: Follow the Willow Forest Road, which is located south of Prince George off of Highway 97 approximately 85 km (53 mi) in a southeasterly direction to the lake. Rainbow and Lake Trout, Kokanee, Dolly Varden are the game fish in Stony Lake. Stuart Lake: This 66 km (41 mi) long, 10 km (6.2 mi) wide lake may be accessed directly from Fort St. James. Lake trout to9.3 lbs, rainbow trout to 5 lbs and kokanee averaging 1.1 lbs are resident in Stuart Lake. Summit Lake: The lake is located just west of Highway 97, 55 km (34 mi) north of Prince George. Rainbow and Lake Trout, Whitefish are the game fish in Summit Lake. Sunset Lake: Sunset is located just a few kilometres southwest of the community of Topley off Hwy #16. Sunset provides a Rainbow fishery with trout reaching into the 1 lb class. Tabor Lake: The lake is located 12 km (7.5 mi) east of Prince George off of Hwy 16. There are cartop boat launching facilities at the north end of the lake. Rainbow trout are readily caught at Tabor Lake. 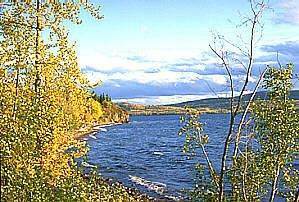 Tachick Lake: From the town of Vanderhoof turn south off Hwy #16 and travel southwest on Kenny Dam Road to reach the east end of the lake. Tachick produces Rainbow trout up to 6+ lbs. Tagai Lake: From the city of Prince George travel west on Hwy #16. Turn south (left) onto the Blackwater Road. Continue southwest for approximately 86 km (53 mi) to the lake via secondary roads off the Blackwater Road. Good success on the fly, or trolling for Rainbows up to 2+ lbs at Tagai Lake. Tagetochlain Lake: From the town of Houston travel west on Hwy #16. Turn south (left) onto the Morice River Forest Service Road. Stay on this road until you get to the Morice-Owen Forest Service Road. Turn left and travel south past Owen Lake. Tagetochlain Lake supports good populations of Rainbow trout and Lake Char. Takatoot Lake: The lake is located approximately 125 km (77.5 mi) northwest of Fort St. James via the Leo Creek Forestry road. Good sized rainbow trout and char are resident in Takatoot Lake. Takysie Lake: Takysie is located approximately 20 km (12.4 mi) south of Southbank on Hwy #35. Takysie supports a very good Rainbow fishery for wild trout to 2+ lbs. Taltapin Lake: Taltapin is located northeast of the town of Burns Lake, and can be accessed by taking the Babine Lake Road north off Hwy #16 to Pinkut Lake and turning east (right) onto the Fisheries Road. This large lake contains Rainbows that will reach up to 3+ lbs and Lake Char to 20 + lbs. Tatuk Lake: From the town of Vanderhoof turn south off Hwy #16 and travel south for approximately 100 km (62 mi) via Sinkut Mountain Road to Tatuk Lake. Rainbows up to 4+ lbs are what most people are fishing for in Tatuk, however the lake also produces good numbers of Kokanee. Tchesinkut Lake: Tchesinkut is located 16 km (10 mi) south of the town of Burns Lake on Hwy #35. Tchesinkut supports a fine fishery of Rainbow, Lake Char and Kokanee. Teardrop Lake: From the city of Prince George take Hwy #97 North to Chief Lake Road. Turn west (left) and follow Chief Lake Road to connecting secondary roads that lead to Teardrop Lake. Teardrop supports a Rainbow fishery for trout up to 2+ lbs. Tezzeron Lake: From Fort St. James approximatley 25 km (15.5 mi) north then 26 km (16 mi) west. The lake is located 6 km (3.7 mi) past Pinchi Lake. Lake trout to 22 lbs and rainbow trout averaging 1.55 lbs are readily at Tezzeron Lake. Trembleur Lake: This large lake is approximately 75 km (46.5 mi) northwest of Fort St. James by air. Access is also possible from Stuart Lake by boat. Rainbow trout and char to 5 lbs are readily caught at Trembleur Lake. Tyhee Lake: Tyhee Lake is located just east of Hwy #16 at the community of Telkwa. Rainbows up to 4 lbs and Cutthroat as much as 2 lbs can be caught at Tyhee Lake. Uncha Lake: From Burns Lake turn south onto Hwy #35 and travel to the community of Francois Lake. Take the free, 20 minute ferry ride across Francois Lake to the community of Southbank. From the ferry dock at Southbank turn left and follow the main road heading southeast to the lake. Uncha contains Lake Char to 20+ lbs, and Rainbows to 2-1/2 lbs. Vivian Lake: From Prince George drive north on Hwy #97 North. Turn west off Hwy #97 North and travel west along Chief Lake Road until you get to the corner of Chief Lake Road and Ness Lake Road, continue west on Ness Lake Road. Turn right (north) off Ness Lake Road and travel about 1/4 mile to get to the Vivian Lake Resort. Vivian supports a mixed fishery Rainbow trout and Eastern Brook trout. Fishing is very productive with reports of Brook trout reaching up to 4 lbs, however most average around 1+ lbs. Wansa Lake: Follow the Willow Forest Road, then turn east across Willow Road for approximately. Follow this road just past Grizzly Lake and then to the lake. Dolly Varden, Rainbow Trout are the game fish in Wansa Lake. Warhorse Lake From the city of Prince George travel north on Hwy #97 for approximately 145 km (90 mi). Turn west onto the Carp-Tsilcoh Road, and drive about 8 km (5 mi) to Warhorse Lake. Warhorse supports good numbers of small Rainbow trout. Weedon Lake: From the city of Prince George travel north on Hwy # 97 to the south end of McLeod Lake. Turn west (left) onto the Weedon Forest Service Road and travel southwest to Weedon Lake. Weedon supports a mixed fishery of Rainbow trout, Lake trout, Dolly Varden and Mountain Whitefish. Witch Lake: The lake is accessed by air approximately 80 km (50 mi) from Fort St. James. Good sized lake trout to 17.5 lbs and rainbow trout averaging 3.3 lbs can be caught in Witch Lake.